Let’s face it: no matter how cool it may be to have a satellite dish, they make terrible lawn ornaments. Only the most hardy space nut finds the local neighborhood array a thing of beauty– and many homeowners associations have introduced covenants prohibiting the use of large dishes. Most Home Owners Associations (HOA’s) have agreed that if the dish is adequately disguised, they will allow it. 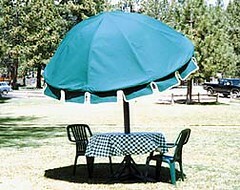 The ClearSat Umbrella Style Dish Cover will comply with most reasonable HOA’s by covering both the front and back, and when coupled with a set of chairs and table, can actually function as a patio set. One or two persons can install the umbrella cover in about 15 minutes. It does not require any drilling or modification to the dish whatsoever. Once the fiberglass rods are inserted between the hub and end socket, the cover springs into shape. You simply rest the end sockets on the edge of the dish and zip up the back panels. The shade provided is not to be overlooked as an added benefit — especially this week, when most of North America is blistering under a scorching heat wave. This entry was posted on Friday, July 21st, 2006 at 12:14 pm	and is filed under Front Page, NASA. You can follow any responses to this entry through the RSS 2.0 feed. You can leave a response, or trackback from your own site.